I'm Back from my holiday in Tobago and to begin with I thought I'd just catalogue the things that we did while we were there. The primary objective was plenty of fishing for Richard and me and some rest and relaxation for Ana and Lilian. First the bad news! The thing that I do on immediately on arrival is to unpack my rods and set them up. My suitcase holds two multi-piece spinning rods a heavier 50-100g Beastmaster for hurling big plugs and poppers and a light 4Surespin used for everything else, plus my eight weight fly rod. They all seemed to be in excellent order until I tried to put the joints together when I found that I'd taken the wrong top section for the light spinning rod - bugger! Richard had two similar spinning rods so it wasn't disaster. 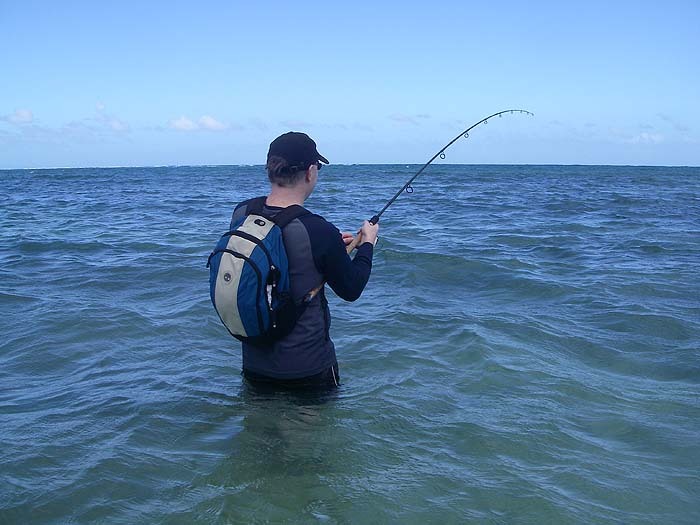 You might wonder why I need two rods anyway, well the truth is that it's really handy to have one rigged with a heavy lure on thirty to fifty pound wire for bigger fish and the other with a light lure on fifteen pound wire for bonefish and other modestly sized fish. We find that wire is essential because of the ubiquitous small (and sometimes not so small) barracuda. My reels are Shimano Stradic 4000s for both rods, a bit small in the spool to pack on enough 30lb Whiplash but wonderfully smooth and amazingly robust. the older of my two reels has probably been doing the business for about eight years with only one replacement handle (the original handle literally wore out). While we were away we fished every dawn and every dusk plus as much time as we could manage in the daylight hours (not as much as we might have liked in view of the needs of our better halves and the requirement to eat, drink, etc.). On the second day I messed things up a bit by getting an infected toe (sort of 'trench toe' induced by keeping my reef boots on for too long without drying my foot). A course of antibiotics had me sloshing about on the flats again within three days but we missed some potentially excellent fishing while I was trying to keep it dry. 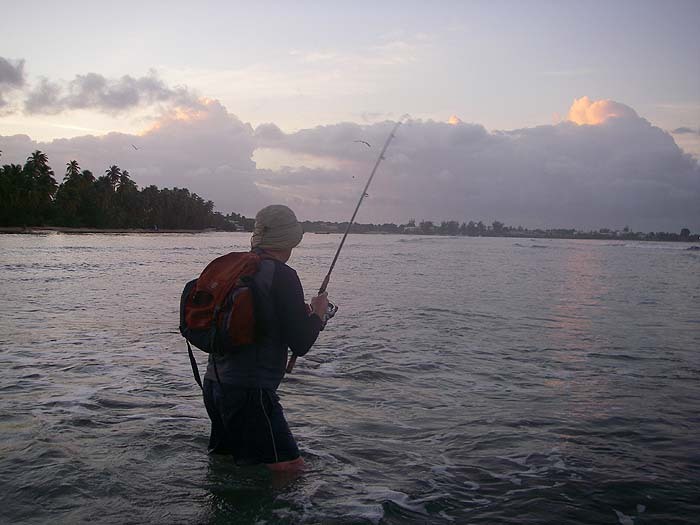 We gained a few mozzy bites (mostly while our legs were tucked under tables), on one occasion I did a six-foot nosedive onto the beach in the gloom and on another Rich smacked his shin on a very hard tree trunk but these are the normal incidents of fishing in the tropics. So much for problems. The accommodation was excellent, the hire car performed well and the fishing was great. We followed the normal plan of trying to have a 'look' at lots of places in the first couple of days then concentrating on the ones where we (1) Caught fish, (2) Saw lots of baitfish or (3) Saw feeding birds. This approach has payed off time after time in the past and this trip was no exception. Of course there were lost fish, occasionally we forgot the camera and we even had the odd blank session. I'm sure that we could have caught even more and bigger fish by lashing out money on boat trips but the excitement and enjoyment could not possibly have been any greater and the snook, barracuda, tarpon, snapper, bonefish, jacks, etc. that we caught were enough for us. We'll certainly be back before too long. More next time.